Phillip Philbeck has created another spectacular image. 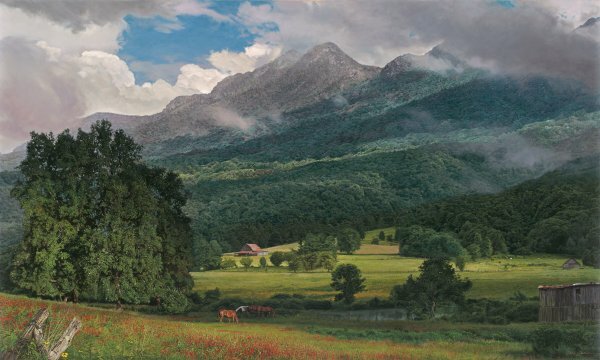 The artist showcases all the beauty of the famous Grandfather Mountain in his home state of North Carolina. The mountain was given its name from a distant view in the landscape where it appears to form the profile of an old man lying on his side. Until 2008, the mountain was a privately-owned property and operated as a nature preserve. In 2008, the State of North Carolina purchased the property. Grandfather Mountain is one of the most popular tourist destinations in the state. It is famous for its mile-high "swinging bridge" that gives visitors easy access, and a thrilling vista, to breathtaking views from the mountain's Linville Peak. The swinging bridge is aptly named for its tendency to sway in high winds.